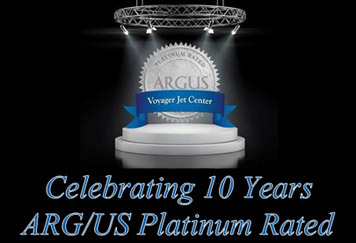 At Voyager Jet Center, aviation safety is our top priority – and it's why we are one of a handful of private aviation companies in the United States that is ARG/US Platinum rated, an accolade which is earned only by the safest jet operators. All our corporate aviation professionals meet specific length of service requirements. We employ professional training from Flight Safety International and Simuflite, in addition to internal quality assurance and customer service tutoring. This assures our clients the highest quality and safest private jet operations possible. Voyager Jet's air crews are supported by some of the most experienced and highly trained private aircraft maintenance crews in the industry. Our aircraft are serviced around the clock, seven days a week. They are meticulously inspected by the flight crew and technicians prior to and after each and every flight, whether private charter or Part 91. All maintenance technicians receive updated factory education on a frequent basis ensuring that they stay abreast of the latest corporate jet maintenance technology, innovations and procedures. Average more than 10,000 incident and accident free flight hours. All Captains receive formal simulator training twice annually. Receive training and certification in CPR/AED applications. Are qualified beyond the minimum experience requirements for ARG/US.